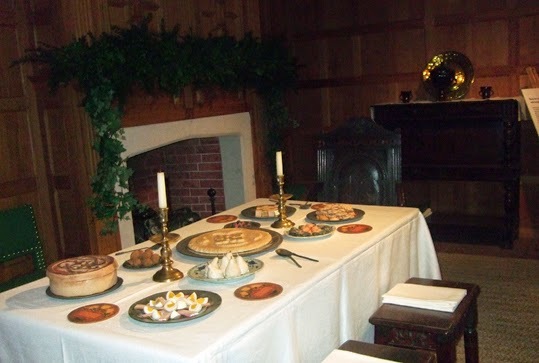 In the photo above, the table is set for a New Year's Day feast in a hall of a London home of the 1630s. 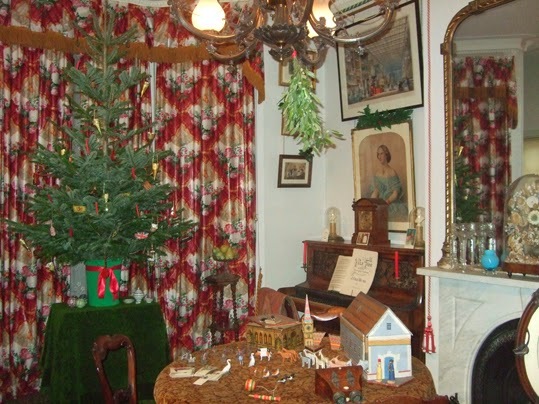 It is part of a display of rooms from an exhibition called Christmas Past at the Geffrye Museum in East London. The feast in the early to mid 17th century would have included lots of sugar crafted into the shapes of other items of food, such as eggs and bacon. Sugar was a real luxury at the time and would have been a special treat to be made the most of. The room is decorated with evergreens. 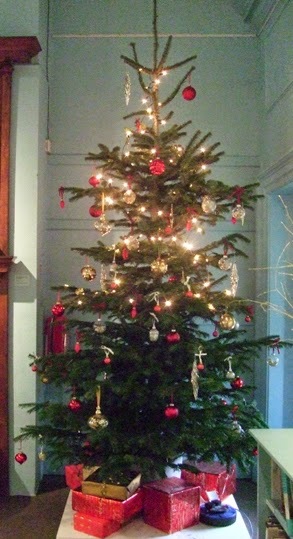 As the description at the Geffrye Museum says: "The use of evergreens was a pagan custom, but early Christians adopted them as a symbol of everlasting life." Although the bringing of greenery into the home at Yule persisted for centuries, it died out in the late 17th century and only really became popular again in Victorian times. The picture at the bottom shows a scene on the evening of Christmas Day in the home of a family from around 1850. It was during the reign of Queen Victoria that most of our recognisable current Christmas customs evolved - including the decorated fir tree. Although Christmas trees had been brought into houses in Germany for centuries, and a few people people in England had them in the past, it was Prince Albert's enthusiasm for Yule trees like the one in the picture to the right that made them fashionable over here. 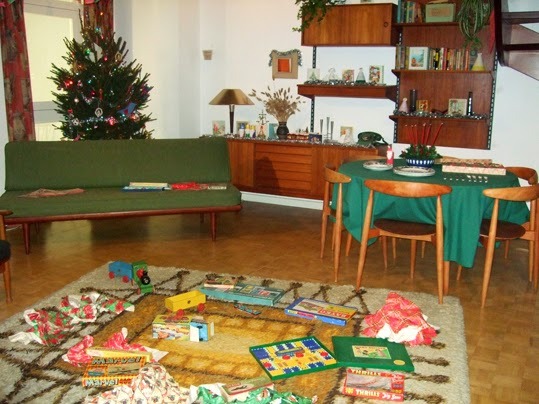 The small picture to the left shows a Christmas Day in the late 1950s or early 1960s after the presents have been opened. That's the scene that reminds me most of my own childhood. I think I even remember playing some of those games. The Geffrye Museum has eleven living rooms in the style of different periods of history. Each December they are transformed with authentic festive decorations, lighting, music and greenery to give visitors a glimpse into how Christmas has been celebrated in English middle-class homes during the past 400 years. There is also an accompanying programme of events including talks and carol singing, ending with a ‘Farewell to Christmas’ – the Geffrye’s traditional burning of the Christmas greenery with stories about Epiphany and a taste of mulled wine and Twelfth night cake. I visited the exhibition to help myself get in the mood for Yule - and it did the trick. A visit is bound to get you utterly nostalgic looking at things you will remember from your childhood Christmases, as well as offering a view of seasonal festivities from the times of parents, grandparents and those who lived in bygone centuries too. Entry to the museum and Christmas Past exhibition is free.